When I was a graduate student at Baylor College of Medicine, I found myself often in an embarrassing situation — I felt completely lost when my fellow graduate students heatedly discussed a paper in our field but I never heard of this publication at all. Later a PubMed search revealed that this paper was indeed published more than a year ago! There was even a time when I didn’t know my own boss had a new publication. It was in part because I was in a big lab and I was not involved in that project. But still, I felt like I didn’t fulfill my duty as an up-to-date young researcher. My problem was finally resolved several years later when we developed the Eye function in Paperbox, which is now renamed Stork. Stork is pretty easy to use. What I need to do is to simply enter all my keywords and researchers’ names and Stork takes care of everything. Stork will help me perform the search every day and send me the results. After using Stork, now I’m the first one in the lab to know that “The most renowned David Boas has a new publication” or “There’s another group using NIRS to hyperscan”. I never embarrass myself again and gain a lot of confidence. I have more than 50 keywords. You may ask “will Stork send you 50 emails a day?” Not at all because Stork respects my inbox. It will compile all results into one email. Stork is also smart. As a researcher, I am sometimes overwhelmed by the flood of publications and have headache in determining which ones are worth reading. Stork helps! She will mark the impact factor of each publication with the yellow color. The more yellow, the higher the impact factor. Therefore I only need to read top publications when I am busy. 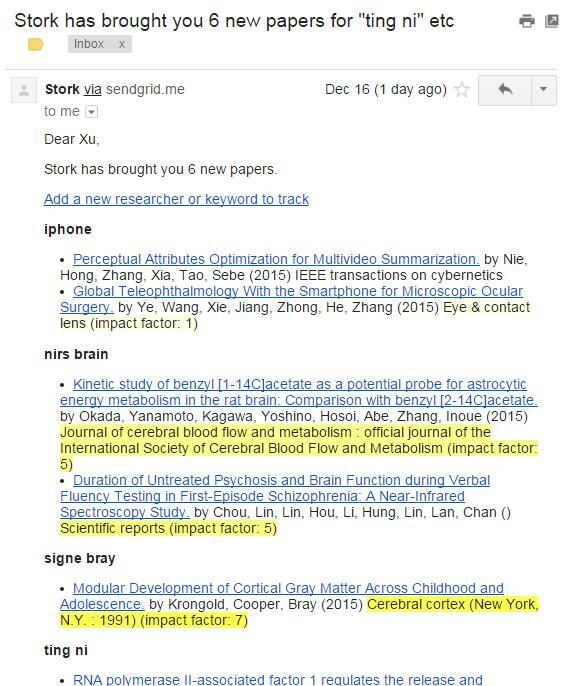 If you also want to be the first one to know new publications in your field, why don’t you give Stork a try? I’m sure you’ll be delighted! Below is one sample email Stork sent to me. Is there a way to change the time of day at which the Stork message can be received? Yes! In the setting page you can change the time.